At the conference we wanted to celebrate some of the amazing projects that our volunteers have completed this year. Each TAD Group was asked to submit a nomination for the 2016 Project of the Year Award. The time, effort and dedication that our amazing volunteers generously give to changing the lives of people living with disabilities is something that we feel is important to acknowledge. 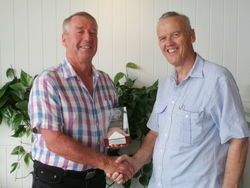 Congratulations to the recipient of the 2016 Project of the Year, Michael Smith of TAD Port Macquarie for his Silicone Liner Applicator project. Congratulations to runners up Barry Lees and Bruce Watts of TAD North West for their Motorised Recliner Chair and all the Project of the Year nominees. Thank you to all our volunteers for your amazing work throughout 2016! Below is a brief description of each project nominated. Following a Discectomy and Spinal Fusion C6 and C7 an Occupational Therapist (OT) at the Orange Health Service OT Department he had experienced increasing neck pain and discomfort as she assessed her paediatric clients. Unless a solution could be found, is was highly likely she would have to cease work. The therapist needed to face the children while in an upright position rather than bending forward toward each child. 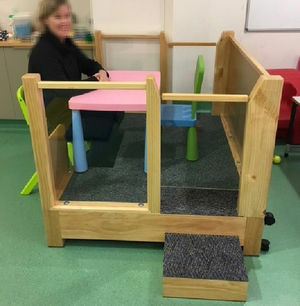 Geoff suggested and it was agreed that a wooden platform should be used to elevate each child while the OT sat in her chair at floor level. The Occupational Therapists (OT) at the Rankin Park Rehabilitation Centre at John Hunter Hospital needed an activity board for clients recovering from conditions which affected their ability to carry out general everyday tasks. 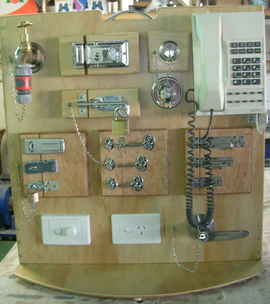 This included difficulties locking and unlocking doors, opening and closing doors, turning lights on and off or simply using a telephone. One of the specifications was that the solution needed to be portable for therapists to take to client’s homes. A carry handle was fitted to the top and rubber feet fitted to the bottom. The board has several levels of activities which require manipulation allowing exercise of gross to fine motor skills. The design needed to be light (for portability) and strong. Items for the board were based on everyday household tasks. The therapists were extremely pleased with the result of the activity board and subsequently ordered a second and third. The client, a 5-year-old child with a spinal cord injury and traumatic brain injury, was unable to access his wheelchair from and to the floor independently. The request was for a Custom Wheelchair Gangplank or Retractable Steps. The child needed definite steps to rest his bottom on, plus strong hand rails as he has good arm strength for lifting his body up and down the steps. The design had to be strong and light in weight as the steps had to be transported in the family car with the wheelchair. The Occupational Therapist (OT) and his mother agreed to a design using conventional steps and hand rails. 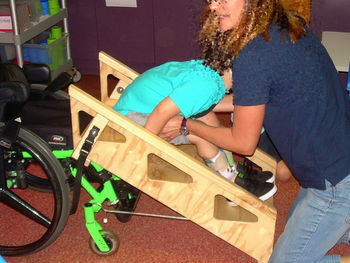 The aim of this project was to provide a device that would give the child independence and carers would no longer be at risk of back injury from lifting the child in and out of his wheelchair. Also, the device had to be portable. All the criteria were met and the child was able to use the steps as designed. There were two sets of steps produced – one set remained at his school, the other at his home. The project worked because of the co-operation between the TAD volunteer, the OT, client and his mother, and his carers. Following a stroke, the client experienced significant mobility limitations. He also has health issues, and usually sleeps in a recliner chair. 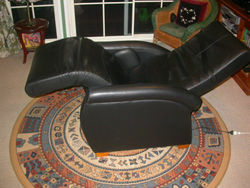 He initially contacted TAD to have a manual reclining chair motorised to replicate one that he already had. Following medical advice, he needed to be able to get his legs higher than his heart. He bought another manual recliner chair and asked TAD to motorise it for him to provide the extended range of motion. Barry and Bruce took on the job. Barry was able to take the chair and dismantle it and he managed to source a linear actuator with the power, stroke and speed for the job. Space was limited for the actuator, and the drive mechanism had to fit through a particular gap in the frame when it was fully extended. Bruce fabricated the components to help the mechanism fit in the confined space. With the chair tilted fully, his feet were 150 mm above his heart. From fully tilted to upright took 11 seconds, allowing him time to reach the facilities when he had to go. The chair’s external appearance was not changed by the modification. The client was very happy with his new recliner chair, which made a significant difference to his lifestyle and wellbeing. This project was a classic example of some of the more complex tasks that TAD volunteers are asked to take on, and the benefit of collaboration to bring out the best ideas. The client is a 7-year-old girl with a number of conditions including myelomeningocele spina bifida resulting in a lesion on her back with risk of skin breakdown. She is unable to support herself and therefore needed a special support in her free standing bath. It was very important that the support was soft and non-abrasive to minimise the possibility of damaging the back lesion. The mother had been using cushions which worked but were inconvenient and difficult to dry. The support had to be soft, appropriately supportive, easily dried and non- buoyant. It had to fit within the bath with minimum clearance to avoid slippage. The device met all the requirements and feedback from the mother indicated that she was happy with the solution as it worked well. The client requesting assistance had a diagnosis of Osteoarthritis, Rheumatoid Arthritis, Osteoporosis and Fibromyalgia. 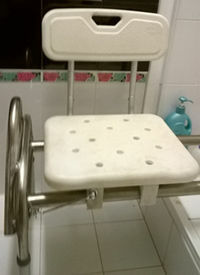 Due to her condition she had difficulty with mobility and she was unable to access the shower recess safely for independent personal care. The request from the OT was for a custom transfer bench which the client could use in the bathroom and in the shower. The bench would need to be made from waterproof materials and had to be easy to slide the seat from one side to the other. It was also important to avoid rough surfaces which could injure the client while ensuring it could be used safely within the bathroom. Bob developed a concept where a plastic seat (donated by the Hills Medical equipment loan pool) that could slide easily along a stainless steel frame. 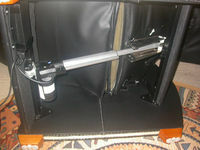 It used a latching mechanism which ensured that the seat would be held firmly in place when at either end of the frame. This solution allowed the client to move into and out of the shower surrounds while being seated and stable. 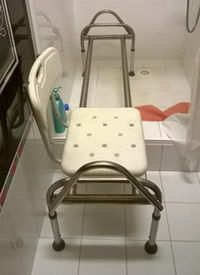 She is now able to shower and dry herself independently while being seated. While improving her overall quality of life. TAD Port Macquarie were requested to assist a client with congenital absence of both lower limbs and left arm. The client had recently received 2 lower limb prostheses to assist in his mobility. But he was unable to fit the required silicone liner, applied to create a soft interface between the stump and the prosthetic moulding, one-handed onto his left side without assistance. Bill wanted to do this for himself. 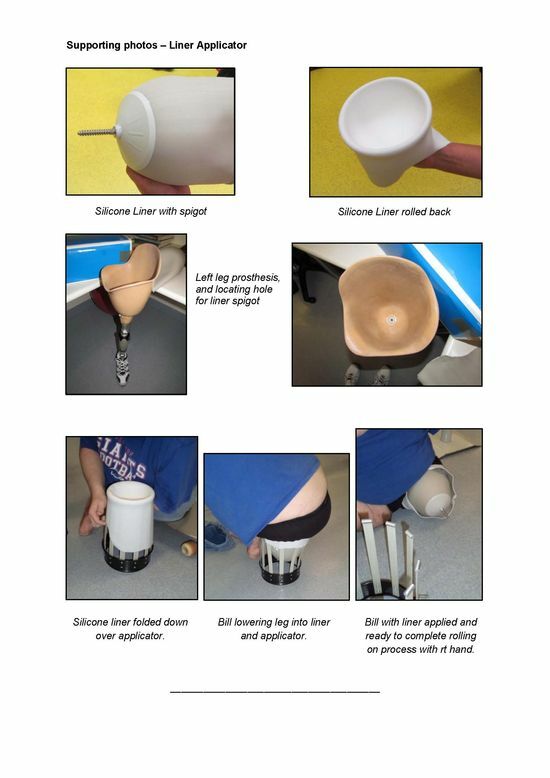 The objective of this project was to make a device that let Bill independently fit the liner to his left leg. Any device would need to be capable of providing a firm uniform application around the limb. The client’s prosthetist advised that there were no such devices commercially available. This was a unique case requiring a unique solution! It was concluded that the liner would be best applied by the client lowering his limb into the liner, supported on expanding flexible fingers. The supple silicone liner would then slide over the tops of the fingers; however, care would be required to avoid tearing it. The fingers would be mounted on a base which rested on the floor. Michael Smith constructed the unit. He chose a 200 mm diameter cake tin having a quick release catch on the side as a base. Releasing the catch would allow the base and the fingers to expand, and facilitate removal of the applicator without dragging the liner back off. The fingers were made from sail batten material. Each finger was topped with a short section of well smoothed aluminium tubing, to ease the liner onto the limb. To everyone’s delight, the device was successful on the first attempt. Well done Mike!